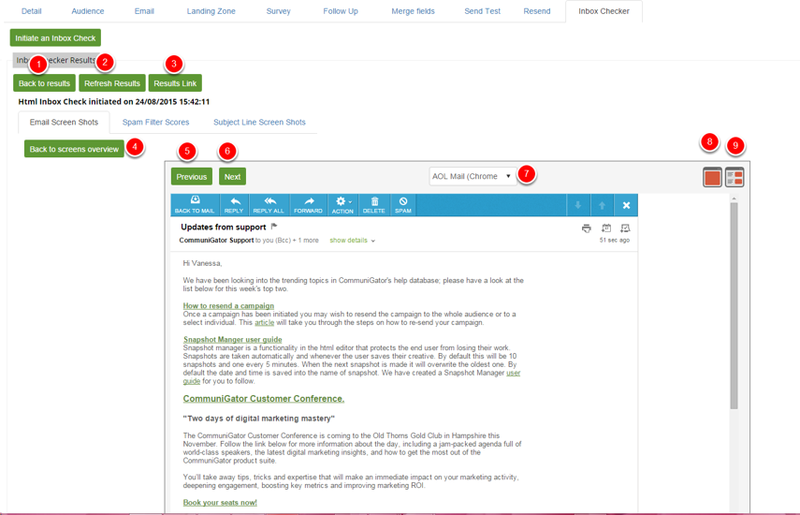 The inbox checker is a very useful tool to have as it shows you what the email will look like in different email clients, as well as providing you with a spam analysis and preview of the subject line. Every client will have the inbox checker tab. However, some clients may only have the basic inbox checker, which will display 2 results, others will have the advanced inbox which will display a lot more results. If you have the basic inbox checker, and would like to try the advanced version, please contact your account manager who can discuss getting this functionality added for you. Click here to initiate a new inbox check. This displays the date & time the inbox check was initiated. This displays the date & time the inbox check was completed. This displays the number of Email checks that have been returned. The contact that was used to generated the email. This is used to populate sections of the email such as custom links or dynamic content which are generated for each user. Current state shows if the check has finished or still running. Clicking refresh updates the page. Once the inbox checker has has finished, you can view the results by clicking on the name of the inbox check. Date initiated- This is the time that the inbox checker started. Date Completed- This provides you with the time the inbox checker finished. Spam Filter Results- How many spam filters it has checked. Associated contact- If you are using dynamic content it will pull through the fields that the associated contact meets. Current state- When this has a green tick the inbox checker has finished. If the inbox checker has a green tick, but the email results are 39 of 41 for example, this means the inbox checker was not able to retrieve the results for those inbox checks. Refresh- if the inbox checker is not displaying any results, ensure you click the refresh results button. After starting the check, you will not see any results until you refresh the page. When clicking on the name of the inbox checker it will take you through to the Email Screen shots which allows you to view what your email looks like in 41 different email clients. 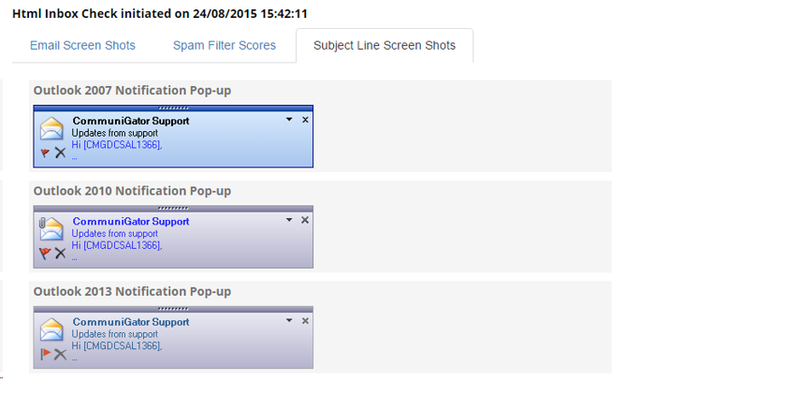 By clicking on the thumbnail images in the screens overview, you can generate a preview of the entire email. The screenshot above is what you will see. This takes you to the inbox checker tab within the campaign to view the results. This will provide you with a results URL to send others. 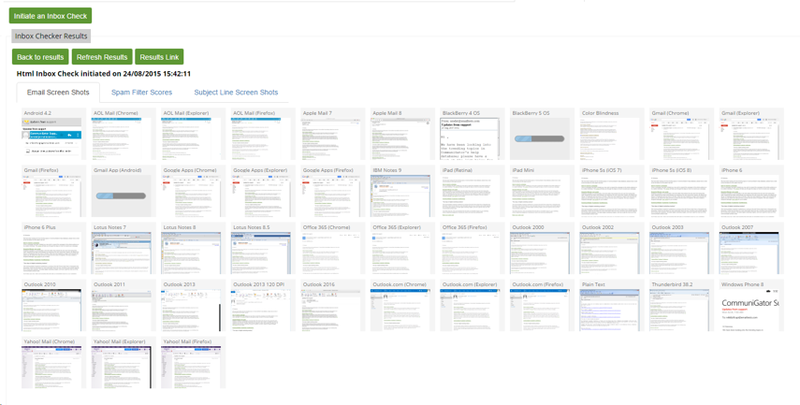 Back to screens overview- This will take you back to the overview which is the screen that displays what the email looks like in different email clients. Next- This will take you to the next email client to preview what your email looks like. Display images- If you select this button the images will disappear from the email, this is useful as some email clients will not download the images automatically, particularly Microsoft Outlook. By clicking on the Spam Filter Scores option you will be able to see if the email email has passed the spam filter test- this does not guarentee that it will pass through the spam filter, but it provides you with excellent guidelines. If it fails on a particular spam filter it will provide you with a reason why it has failed. By clicking on the Subject line screen shots tab, you can access a list of what the notification pop-up looks like when the recipient receives an email. This is very useful as it is key to making your email as engaging as possible, and can influence whether the contact opens the email or not. Please note in the screen shot below where it says "Article" this is taken from the first line of your email. It is best practice to make this engaging; a lot of email marketeers forget about this and send out emails with a preview that displays HTML code and does not in fact display a catchy line to hook the contact on reading the email.